Special Containment Procedures: SCP-2263 is to be kept in standard safe object storage at Site-63 with the exception of SCP-2263-34, which is to be kept in highly explosive materials storage and SCP-2263-62, which is to be kept in radioactive materials storage. Due to potential as of yet undiscovered dangers, no experimentation is to be done on any instance of SCP-2263 without express permission from Site-63 administration. 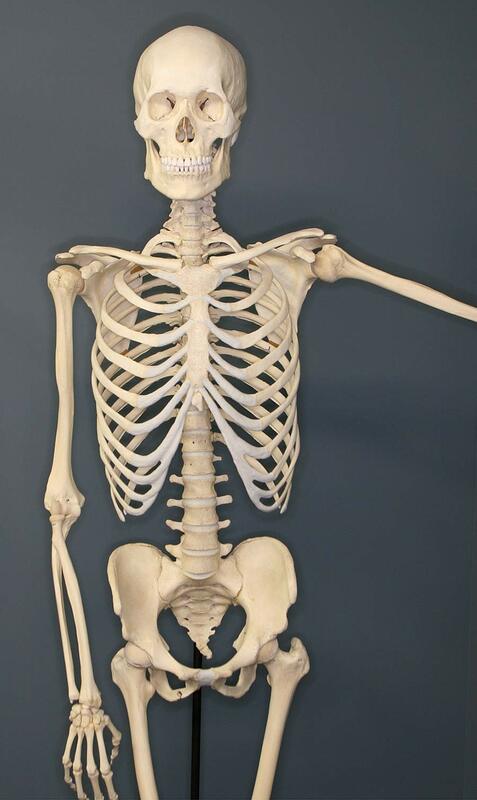 Description: SCP-2263 is comprised of 62 anatomically accurate, identical sculptures of a human skeleton, all of which are made out of anomalous materials. Each skeleton measures 190 cm tall, and has a mass of 11 kg, regardless of composition. Each skeleton is held together with silver wire, and mounted on a 5 cm thick lithium carbide disk, with a radius of 0.3 meters. Every instance of SCP-2263 has a descriptive tag affixed to its third left rib. Each tag is written in Dutch, with the same handwriting. Below are a selection of individual instances of SCP-2263, with a translation of their respective tags. SCP-2263-18 Unknown, best described as "the color blue" not quite sure how I got this one to work, but glad it came out well Object appears as a blue, two dimensional image of a skeleton matching the dimensions of other sculptures, which appears as the same image regardless of angle it is viewed at. SCP-2263-18 itself is intangible, but it is "constructed" on a stone platform, which exhibits no anomalous properties. SCP-2263 was discovered in a warehouse in ███████, Ohio, which was registered to a Mister Johann ████. Upon research it has been discovered that no such person had ever lived in the town. The Foundation first became aware of SCP-2263 after local authorities investigated a break-in report and discovered SCP-2263's anomalous properties. Objects were recovered by Mobile Task Force Omicron-3 ("Spooky Scary") over the course of 13 hours. All 62 instances were successfully recovered, and MTF-O3 suffered two casualities, three instances of severe burns, one instance of hypothermia, one severed arm, and one instance of radiation poisoning. At the warehouse in which SCP-2263 was recovered; a mattress, approximately 3 months worth of canned food and bottled water, and various sculptural tools were found, as well as 62 letters (one for each instance) written in Dutch and addressed to an individual named only as "Jacob", explaining how long each piece would take to complete, and how much it would cost to produce (each instance was always billed at exactly $543.21 USD). No explanation is ever given as to how an instance of SCP-2263 is created, or how materials are acquired. Only one reply was found at the scene, also in Dutch, addressed to the warehouse. See below for a transcript. 1. This individual's identity is not currently known, but is believed to be an associate of the creator of SCP-2263, as several letters addressed to a Jacob ██████, in Maastricht, The Netherlands were found at the site of SCP-2263's recovery. Upon investigation, no such person was found to exist.